From now until mid-September, Alec Elliot’s swim career has one focus: apply all of his hard work, competitive experience and drive to take home gold. The 20-year old, first-year student in Laurier’s Health Sciences program will be swimming in six events as a member of Team Canada at the Rio 2016 Paralympics, which runs from Sept. 7 to 18. Many would agree that Elliot’s swimming career is just getting underway. Born with syndactyly, which limits the use of his hands and feet, Elliot was classified by Swim Canada as an S10 in swim competitions. It was well before this classification, however, that Elliot dipped his toes into competitive swimming. And talented he was. Ever since Elliot’s success at the junior level, he has not looked back. In 2015, he represented Canada at the International Paralympic Committee Swimming World Championships in Glasgow, Scotland, and again at the Para Pan Am Games in Toronto, where he reached the medal podium six times. Much of his success, apart from his strong natural swimming ability, is attributed to his mental strength and drive. His routine, a defining part of his accomplishments, speaks to his commitment. “Getting up at 4:30 a.m. for practice, then having a full day of school, and working out after helps a lot,” he says. Yet Elliot has had to overcome adversity on the road to Rio. A problem arose earlier this year when he incurred a shoulder injury during weight room training. The injury caused him to take a couple of weeks off and then get right back into action at a key moment before trials to make the Canadian team bound for Brazil. 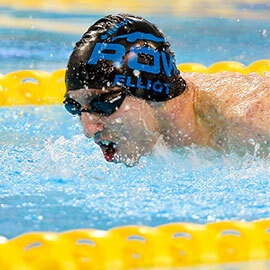 For the past year, Elliot has been training in Laurier’s pool with Hans Witolla. An elite level coach at the region’s swim club, Witolla is also head coach of Laurier’s swim team and has worked with several Olympian athletes from Ontario. Elliot is quick to acknowledge Witolla’s support. In August, Elliot spent two and a half weeks at training camp in Gatineau. As a member of Canada’s 22-person swim team at the Paralympics in Rio de Janeiro, Elliot will be swimming in the following events: 50m freestyle, 100m breaststroke, 100m backstroke, 100m butterfly, 100m freestyle, and the 400m freestyle. Photo Credit: Swimming Canada/Scott Grant.